Swimming pool with a view, rooftop bar, design restaurant, hotels are revealing their best assets to draw local clients into their realm. Today, most properties are opening their infrastructures to outside clients, as may be seen in the results of a survey realized by Hospitality ON, with Olakala. One of the major current trends in the hotel industry today is the creation of friendly common areas, particularly in lobbies which are increasingly becoming living spaces. Hoteliers try to attract clients from outside their property so exchanges with the environs have thus become an important goal for hoteliers, particularly for those offering services other than accommodations (restaurant, spa, meeting rooms...). 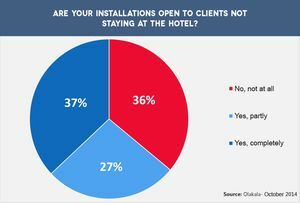 To strengthen their local reputation and generate additional revenues, close to 2/3 of properties are opening up their infrastructures and services, as may be seen in results from a survey of French professionals by Hospitality-ON, with Olakala: 64% of hoteliers surveyed make their installations available to clients who are not staying at the hotel. 27% of all hoteliers make them partially accessible, while 37% make them totally accessible. Inversely, 36% of respondents reserve them for the exclusive use of their guests. The neighborhood thus becomes a more important source of clients at hotel properties. Nonetheless, the share of clients from outside the hotel in the total occupancy of the property varies significantly in function of the hotel's location, with an average of 30% for all those responding to the survey. The trend is even more significant in city centers, where hotels are increasingly positioned as an actor in and of their own in the neighborhoods where they are located, but also in rural areas where clients staying at hotel-restaurants are often outnumbered by local clients who are regulars at the property's restaurant. Olakala is an innovative online survey management platform. Its specialty is customer satisfaction and experience survey management in continuous flow: decrypting customers’ click-stream, putting basic expectations ahead of secondary ones, identifying the differentiating elements vis-à-vis your competitors while improving your performance and profitability indices: Olakala provides you with support to manage your daily actions.